The only time I buy cereal is when Kellogg’s have their annual Grown-ups Go Free promotion. Last year we used them to take the boys to Lego Land for the first time and I’ve got my tokens on the fridge ready for this year’s visit. And this time we’re all going on the big roller-coaster. My kids tried Coco-pops for the first time and they weren’t as impressed as I thought they’d be. I remember loving Coco-pops as a kid. Maybe cereal is acquired taste, who knows? 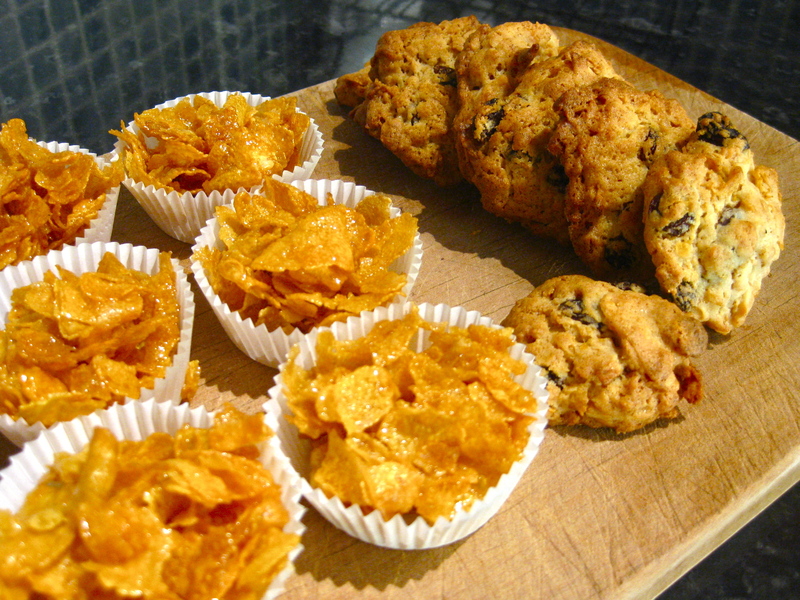 The cornflakes were put aside for baking and so I thought I’d share a couple of recipes. I don’t know if Brits make a habit of baking with cereal, but I know that Aussie’s love cornflakes in the kitchen, as do Kiwi’s with their delectable Afghan biscuits. 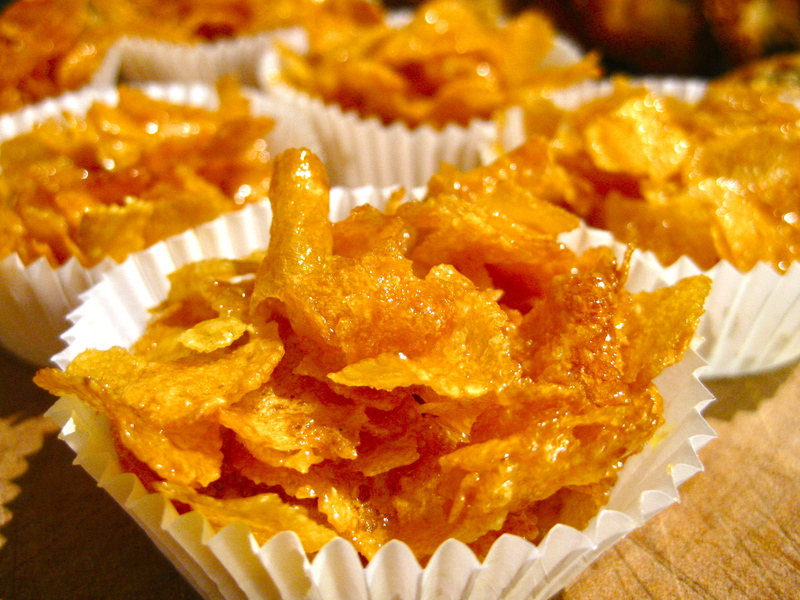 I grew up with Honey Joys as a regular at kid’s parties and school fetes and the cornflake cookies were something my mum made. The cookies are light and cakey, I’d recommend using flaked coconut but desiccated is just fine. The Honey Joys recipe can be halved neatly. 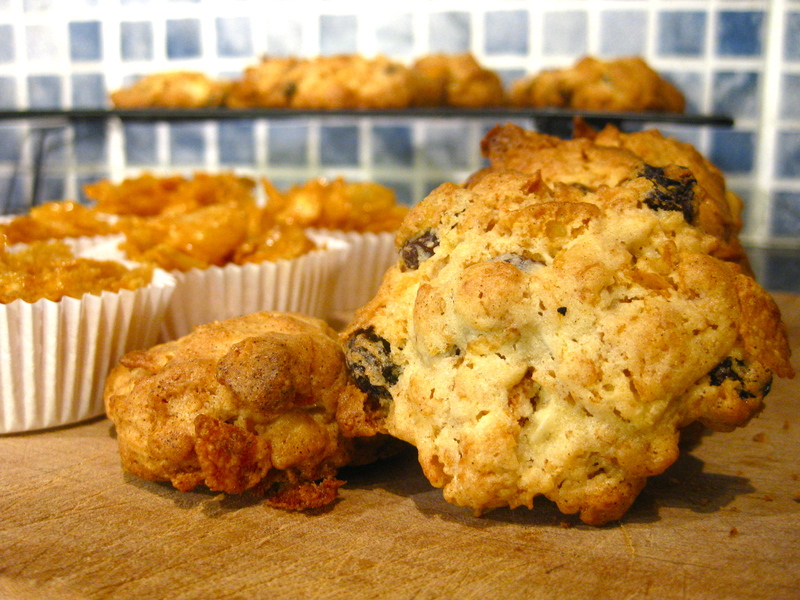 Roll balls of the dough and place on prepared tay, flatten slightly. Place muffin cases into a cupcake pan. This recipe makes about 24. Put all the ingredients into a saucepan, lightly heat until it all starts to go a bit frothy. Stir in the cornflakes, till they’re all coated. Working quickly, spoon spoonfuls into muffin cases. Bake for about ten minutes then cool. They’re ready to eat when they’re cool and crispy. Thanx for sharing the recipe methods.